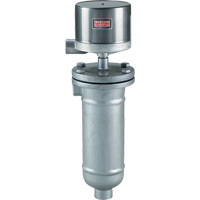 Heavy duty flanged chamber features removable float for ease of inspection and maintenance. The 221 Series also provides 1" NPT for standard external mounting. Socket weld hubs or flanges are optional. Rugged C1-75 construction is suitable for operation at 1000 psi (69 bar) at 100°F (38°C), and 850 psig (59 bar) at 475°F (246°C) with a minimum specific gravity of 0.75. C1-60 construction is suitable for operation at 600 psig (41 bar) at 100°F (38°C), and 550 psig (38 bar) at 475°F (246°C) with a minimum specific gravity of 0.60. Models featured can be ordered with various circuits including SPST, SPDT, or DPDT with hermetically sealed snap action or mercury contacts. A full range of enclosures are available including general purpose, weatherproof, explosion-proof, or explosion-proof – vapor proof. C1-60: Minimum specific gravity 0.60; Process pressure 600 psig (41 bar) at 100°F (38°C), 550 psig (38 bar) at 475°F (246°C). C1-75: Minimum specific gravity 0.75; Process pressure 1000 psig (69 bar) at 100°F (38°C), 850 psig (59 bar) at 475°F (246°C). Switch Type: Snap action or mercury switch. Electrical Rating: See Model Chart. Wiring Connections: G, WT or E enclosure, terminal block. EV enclosure, 18" (460 mm) leads. Process Connections: 1" NPT standard (socket weld hubs or flanges optional). See Model Chart. Enclosures: G, painted steel and aluminum. WT, painted steel, aluminum and neoprene. E, aluminum. EV, aluminum and neoprene. Wetted Parts: Chamber, carbon steel. Trim 316SS, 303SS, 304SS and 430SS. Weight: 221: 60 lb (27 kg); 223: 70 lb (32 kg); 224: 77 lb (35 kg). EXAMPLE 221 WT 7810 C1 60 221-WT-7810-C1-60 Liquid Level Control, weatherproof enclosure, SPDT snap switch, fixed deadband, automatic reset, operating pressure 600 psig (41 bar) at 100°F (38°C), 550 psig (38 bar) at 475°F (246°C), side/bottom process connections, 1" NPT, minimum specific gravity 0.60. E Explosion-proof, NEMA 7, 9, Class I Groups B, C, D, Class II Groups E, F, G. CSA approved Groups C, D, E, F, G only. EV Explosion-proof/Vapor-proof, NEMA 7, 9, Class I Groups B, C, D, Class II Groups E, F, G. CSA approved Groups C, D, E, F, G only.